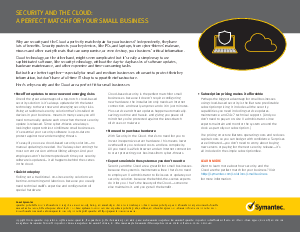 Why are security and the Cloud a perfectly matched pair for your business? Independently, they have lots of benefits. Security protects your key devices, like PCs, and laptops, from cyber-thieves’ malware, viruses and other nasty threats that can compromise, or even destroy, your business’ critical information. Cloud technology, on the other hand, might seem complicated but it’s really a simple way to use sophisticated software, like security technology, without the day-to-day hassles of software updates, hardware maintenance, and other expensive and time-consuming tasks. But both are better together—especially for small and medium businesses who want to protect their key information, but don’t have a full-time IT shop to support the infrastructure. Here’s why security and the Cloud are a perfect fit for small businesses.